We are an association dedicated to Original Hot Yoga. OHYA is dedicated to moving our Original Hot Yoga community into the future. We are the authority and destination to find Original Hot Yoga. We vet our studios to make sure they are meeting our standards to ensure all yoga enthusiasts can find our studios and REAL Original Hot Yoga. 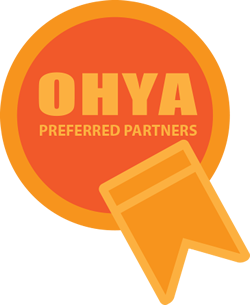 Look for the OHYA “Studio Partner” seal when you are searching for Original Hot Yoga. Our Mission is to Unite, Support and Promote, Original Hot Yoga Around the Globe. Our Studio Owners are the pioneers who are the soul and backbone of this community. Plus, with our Approved Teacher Trainings, OHYA is ensuring our continued success by training the next generation of OHYA Teachers. gives our teachers the support of a professional Association that validates their hard earned teaching certificates. OHYA is your resource to find our studios, Approved Teacher trainings, continuing education, seminars and workshops, and so much more. OHYA is your one stop tool to connect you to our community. Businesses who understand hot yoga studios. The mission of the OHYA is to unite, support and promote our community of Original Hot Yoga studios, teachers and students across the globe. The OHYA is your one stop place to find studios, furthering education, workshops, retreats and Endorsed Teacher Trainings for the next evolution of our unique and highly specialized Original Hot Yoga community. OHYA Studio Directory – All the studios in our directory are owned by Certified Bikram teachers and highly trained to lead the series. Our studios are categorized as Type 1 if they still only teach the original 90 minute series or Type 2 if they also offer 60 or 75 minute versions or other classes. Please see the studios individual schedule for details. Our Calendar of Events offers a variety of workshops, retreats, seminars, and furthering education for our teachers and students. Our Endorsed Teacher Training page showcases the OHYA approved trainings dedicated to passing on the 26 & 2 method to the next generation of original hot yoga teachers. The original hot yoga community has experienced some changes the last few years, but the OHYA remains passionately dedicated to the series of 26 postures and 2 breathing exercises done in a heated room. While we acknowledge the incredible yoga system passed on to us from Bishnu Ghosh and Bikram, and we are grateful for the knowledge we’ve been given, the OHYA aims to paving the path forward for the future of our studios, teachers and greater original hot yoga community. All of the owners of the studios listed in our Studio Directory are Certified Bikram Yoga teachers.